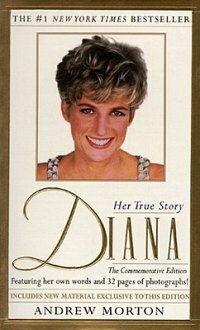 Description: For the first time, here is the true story of Princess Diana, complete with revelations that will shock the world. Diana: Her True Story is a unique royal biography. It is based on facts that are published here for the first time and includes private photographs made available exclusively for this book. The author has had the cooperation and support of members of Diana’s family and her closest friends. They have all spoken freely of Diana’s life, her problems, and how she has tried to solve them. Andrew Morton has painted a shocking portrait that will be front-page news all over the world. Diana, Princess of Wales, is one of the best-loved women in the world. Since her storybook marriage to Prince Charles, she has captured the admiring eyes of the public. We have watched her blossom into a great beauty, raise a young family, and campaign for a long list of charities. Her world seems perfect. But behind this image of perfection lies a disturbing truth. Here, Andrew Morton reveals that truth. In Diana: Her True Story we learn that Diana’s marriage to Prince Charles has been unhappy from the very beginning. In fact, Diana has described her wedding day as the most emotionally confusing day of her life. Behind Diana’s elegant, smiling face is a woman trapped in a loveless marriage, who has suffered from chronic illness and loneliness, and who has gone to the depths of despair where recovery seemed impossible. Yet she has courageously struggled to create a new life for herself. This is a stunning book because it tells the truth. It tells the story of a girl who became a princess before she became a woman and the story of a woman who found herself through adversity.